In the past, there were only a few specialists worldwide who worked intensively with typography. Since the introduction of digital fonts and their dissemination via the internet, typography has gained a new significance. More and more designers are creating fonts for a variety of applications. Simultaneously, more and more of these designers are founding type foundries to sell their fonts themselves. Supply and demand in this area have been growing considerably for years. The expanding market for typography is exciting and diverse, but it has been difficult to keep track of notable developments––until now. Type Navigator is a comprehensive handbook of the best independent sources for quality fonts. Structured and indexed according to practical criteria, it offers not only a valuable overview, but also possibilities for effective targeted searches. Whether a reader is in need of a specific type of font, is looking for fonts by a select designer, from a certain country, or even just wants to compare prices, Type Navigator will provide the necessary information. In addition to abundant examples of fonts as well as concrete applications for typefaces and alphabets, this essential compendium features concise profiles of type foundries and designers. Select interviews with managers of type foundries show how their creative visions are influencing the characteristics of their font libraries. 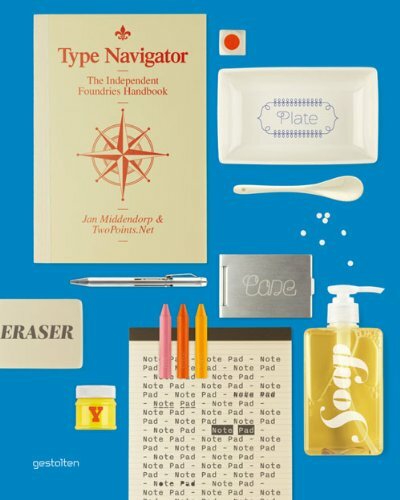 Type Navigator is a valuable reference for agencies, designers, consultants, and customers who are looking for an overview of the modern typefaces currently available and the innovative people and companies behind them. A free digital collection of 100 typeface variations from 20 choice foundries accompanies the 320-page book. Type Navigator is edited by typography expert Jan Middendorp as well as the former Hort designer Martin Lorenz and his wife Lupi Asensio, who currently work together as TwoPoints.Net.